All The Calls & Clearings from Club Gold 2010 and Two Bonus Gifts! Change your reality with money, business and finance. This year was all about money! What if money could be fun and easy? It changed my entire financial reality! 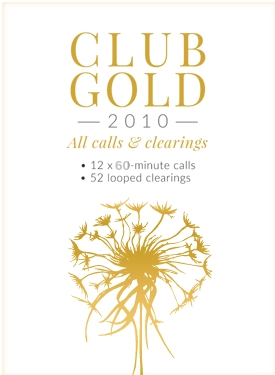 Enjoy all the calls and clearings from Club Gold 2010--and two bonuses! A delivery email with download instruction will be sent to you so that you may download your mp3 files. If you log in prior to purchase you will also be able to access your downloads from your account dashboard.